RPS Engineering’s CHLC-Series hood assembly is a ¾ corrugated cover and band with a 135° coverage. 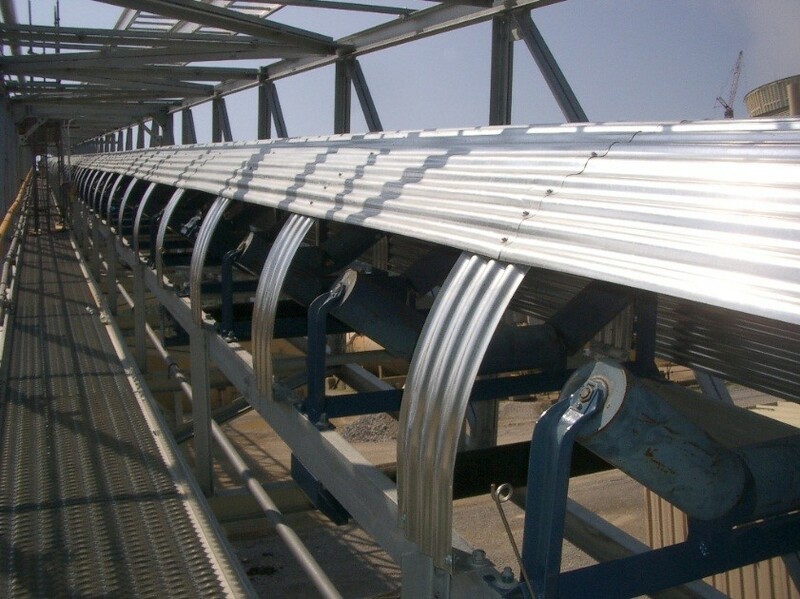 Because the corrugations are parallel with the belt, these are a more economical cover system. They are stationary with a standard 45° opening. This allows for inspecting or viewing the items being conveyed and the ease of repairing, replacing, greasing or inspecting of the idlers without touching the cover assemblies. They help to protect the belt, idlers and material being conveyed from the hot sun, wind, snow, rain and other damaging weather elements. Our CHLC Cover Assemblies can be made for 18”, 20”, 24”, 30”, 36”, 42”, 48”, 54”, 60”, 72”, 84”, & 96” belt widths. Custom sizes are also available. Standard cover panels are made from 24 gauge, G-90, corrugated galvanized steel with the bands made from 20 gauge, G-90 corrugated galvanized steel. The assemblies come with heavy duty galvanized steel mounting clip angles and standard zinc plated hardware. These assemblies can be made to accommodate 3’ through 5’ idler spacing with 4’-0” being our standard. Optional cover and band material includes Aluminum and Stainless Steel. AT RPS ENGINEERING, INC., WE’VE GOT YOU COVERED! Click here for additional options that are available.